While the 8,164-kg. capacity RBJ18000 will handle the weight of many heavy-duty vehicles, some larger trucks, buses and commercial drivers have significantly offset centres of gravity. It’s important to ensure your bridge jack is rated for the entire weight of both the front and back axles of the vehicle. 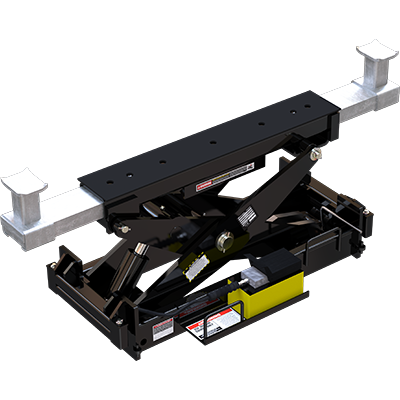 The extra lift capacity of the RBJ18000 will compensate for a shifted centre of gravity in heavy-duty vehicles being raised on the HDS35 or HDS40 series. Our contact pads are super-tough and capable of withstanding heavy use and abuse for years on end. They won’t rip, tear, scratch your car or leave ugly marks. Use them on virtually any vehicle type for a safe and secure lift. They’re also low-profile enough to fit under virtually every low-stance car on the market. Heavy-duty vehicles almost always have high ground-clearances. This means our stackable adapters are a must-have accessory. Luckily, they come standard with your jack purchase. No need to buy more material for something you need. Your bridge jack offers plenty of lift, and these adapters ensure you get to enjoy as much of it as possible. The power unit on the RBJ18000 is strong enough to lift those massive city buses and farm equipment you’re raising on your HD-35 four-post lift. A simple foot pedal controls the jack, which reaches its max extension in seconds flat. Your work, your shop. With three lock positions, your rolling bridge jack adapts to the way you get things done. Different factors change your working height: operator preference, operator height, vehicle clearance, ceiling height and more. With three lock positions on the jack, your ultimate working height is that much more versatile.